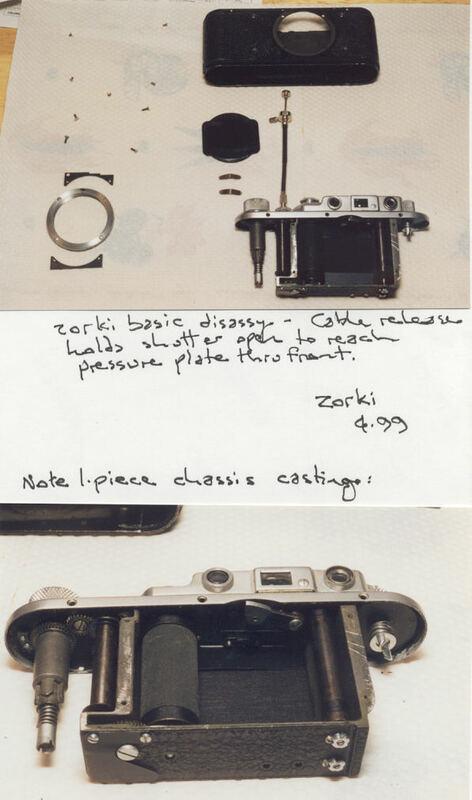 The most common cause of trouble in the Leica/FED/Zorki shutter is dirt and film chips getting into the large pair of gears at the bottom of the big curtain drum (just visible peeking out at the lower left of the chassis above). Make sure these gears are completely clean and running smoothly before you attempt any other adjustments. Once you know everything's clean, the last resort is adjustment of the spring tension, using the two small silver star-shaped knobs at the right in this view. Counterclockwise increases speed; the opening curtain spindle is on the bottom in this view, the closing curtain spindle is on top.